Have you been searching for an incredible bargain on the multifunction KIP 9900 wide-format printer to meet your business’ needs? Great, that means you are in the right place. 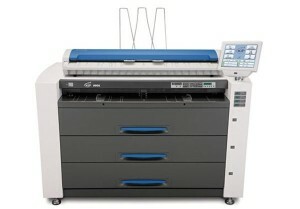 Arizona Copiers introduces the broadest selection of top KIP models in the whole state of Arizona, right in our stock. If you need to purchase, lease, or rent the printer, we will work diligently with you to offer the optimal solution for your business. At Arizona Copier, we are committed to achieving 100 percent client satisfaction. Therefore, we guarantee speedy delivery, exceptional customer service, and helpful repair services for a long-lasting business relationship. Contact us today at 602-428-5885 with all inquiries about our KIP models and receive an excellent quote on your newest purchase! Specifically engineered to be the fastest wide-format printing system on the market, the KIP 9900 multifunction printer is perfect for high demand document traffic. Set new productivity benchmarks with the incredibly fast output speed of 22 “D” size prints every minute. Not only does the KIP model produce prints quickly, it enhances business output quality with its 600×1800 dpi resolution imaging technology. The accurate gray scale detail and fine line capabilities are sure to satisfy even the most exacting quality standards. In addition, your business can also choose to upgrade easily to incorporate color copying and scanning as well. When you purchase the KIP 9900 printer from Arizona Copier, the wide variety of applications have features that will deliver significant productivity gains and improved ease of use. The large touch screen display is simple to navigate, even for untrained personnel members without a background in technology. All system functions are available at the swipe of a fingertip from the convenient LCD control panel. The key features of the touch screen enable job queue management, network security, integrated accounting, and scanning to email or other networks in a breeze. Moreover, this KIP model equips busy professionals with the ability to stay productive throughout the day, even on the go. With the unique KIP cloud printing features, you will be able email files to your KIP 9900 printer from any mobile device for future viewing or printing. You will benefit from the ability to produce large, wide-format prints from email attachments with print instructions. Whenever you need it, the KIP 9900 is ready to print with speed and accuracy from wherever you are. Get Your Own KIP 9900 Today! Arizona Copier is your best asset for fulfilling all of your printing and copying business needs throughout our extensive service area throughout the state. We are the premier source for the most cost-effective and high-quality solutions that will meet all of your business’ financial budget requirements. Whether you are looking to buy, lease, or rent the KIP 9900 wide-format printer, we are confident that you will not find another company that can provide quality products at our bargain prices. Start supporting your business profit by calling 602-428-5885 today to speak with our exceptional sales representatives. We look forward to proving to you why we are the best copier company in Arizona!